All new and ex-demo products sold by Allegro Music are supplied with a minimum of a full 12 month parts and labour guarantee. All second hand goods are covered by a minimum 3 month parts and labour guarantee. 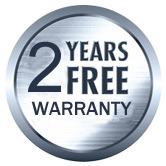 Many of our products feature free extended guarantees. The length of theses extended guarantees will be stated on you receipt. If your product should fail for any reason within the first month of purchase, we will collect and replace it with a brand new one, free of charge. Please note that ex-demo equipment and second-hand equipment is not covered by this policy. In the case of goods that fail after the first month, or ex-demo and second-hand goods that fail at any time within the warranty period, we ask that you return the goods to us by an insured method. We will repair the item free of charge and return them to you by an insured delivery method. The return delivery costs are payable by the customer. Before returning any equipment you must complete our return request form. Click here to complete the form. We accept Visa, Mastercard, Visa Debit and Maestro. All orders are processed through Sagepay using SSL encryption for your security - which means it's very safe! When you purchase a product from allegromusic.co.uk, we will send you an e-mail confirming receipt of your order. We'll then process payment as soon as your bank has verified your details, and indicate acceptance of your order by sending you an invoice via email. If a product is not available to despatch at the time of the order, the payment taken will be regarded as a pre-payment and the item will be back ordered for you - this is for your security as well as ours, and we will always email you to let you know so you have the option to cancel your order if you would rather not wait. We reserve the right to terminate the transaction in the event that the goods are unavailable, miss-priced or cleared funds are not received. If you have made a mistake in your order and cannot correct it in the shopping cart, contact us as soon as possible and we will make the appropriate changes. Please note that all website prices include VAT at the current rate where applicable. If you live outside the UK mainland please contact us prior to placing your order. We do not currently offer a delivery option to non-UK addresses via this website. Orders to non-UK addresses must be placed over the phone and we will confirm the delivery options and delivery charge. All orders will normally be fully insured against loss or damage whilst in transit; any damage must be reported within 48 hours of receiving your order. All electrical products purchased from Allegro Music will be designed to work on UK voltage and, where appropriate, will come with a 3 pin, UK style mains lead. Please note that whilst we offer a 12-month warranty on all new goods shipped outside the UK, we do not cover the cost of returning faulty or damaged goods. If you need to return a product, please contact us in advance of returning an item to obtain a returns number. Within 7 days of purchase we are happy to exchange or give you a refund with vouchers for any item you purchase. Just return the item to our store, unused, in its original undamaged packaging, along with the receipt and we'll be happy to exchange the item for something more suitable, or give you a refund in Allegro Music vouchers. We do not give cash refunds in cases of 'change of mind'. Click here for our online Returns Policy and to complete a Returns Request.